In a previous diary I wrote about running snort on Vmware ESXi . While that setup might be suitable for small setup with one ESXi host, it might be not suitable for larger implementations with multiple VSphere hosts. In this diary I will discuss deploying Snort on larger implementation with SPAN/Mirror ports. SPAN ports require VMware Distributed Switch (dvSwitch) or Cisco Nexus 1000v. VMware dvSwich is available with VMware VSphere Enterprise Plus while Cisco Nexus 1000v is third party add-on. Both solutions required VSphere Enterprise Plus and VMware vCenter. The test lab consists of Vmware ESXi 5.1 as host, VMware vCenter 5.1, Kali Linux, Security Onion and Metaspoitable VM. ESXi 5.1 will be the host system and Kali VM will be the attack server, while Metaspoitable will be the target and Security Onion will run the snort instance. (Figure 1). The VMware vDS extends the feature set of the VMware Standard Switch, while simplifying network provisioning, monitoring, and management through an abstracted, single distributed switch representation of multiple VMware ESX and ESXi Servers in a VMware data center. 7- Choose whether to use this source for Ingress or Egress traffic, or choose Ingress/Egress to use this source for both types of traffic. 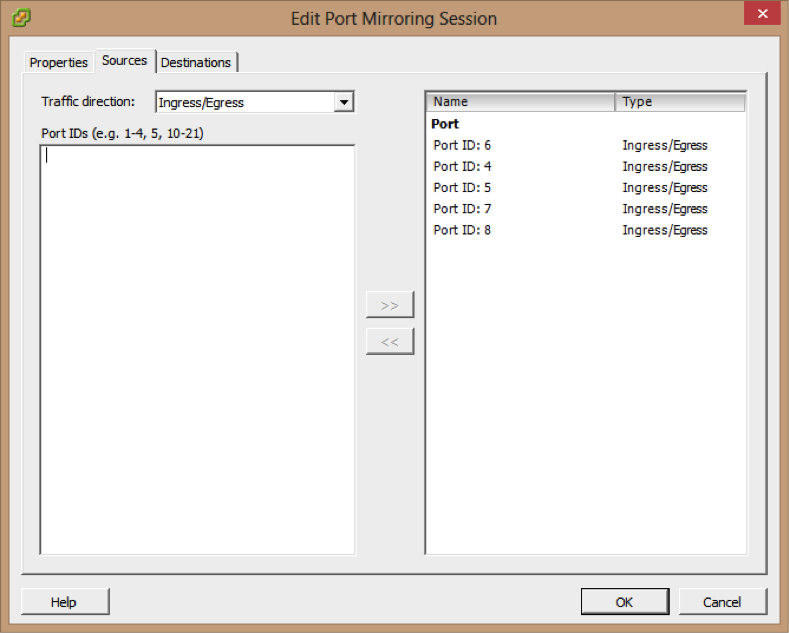 8-Type the source port IDs and click >> to add the sources to the port mirroring session. 10- Choose the Destination type port ID. 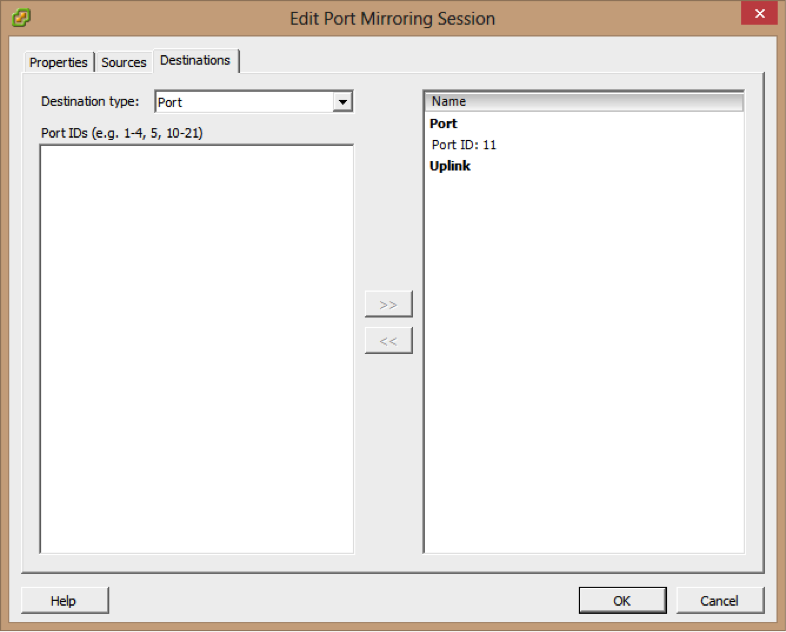 14- Click Enable this port mirroring session to start the port mirroring session immediately. 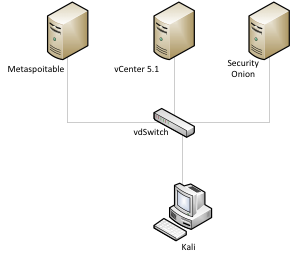 For this lab the traffic going to metaspoitable VM will be mirror to eth1 on Security Onion Server. The first test is fingerprinting the metaspoitable vm with nmap and snort detected this attempted successfully. 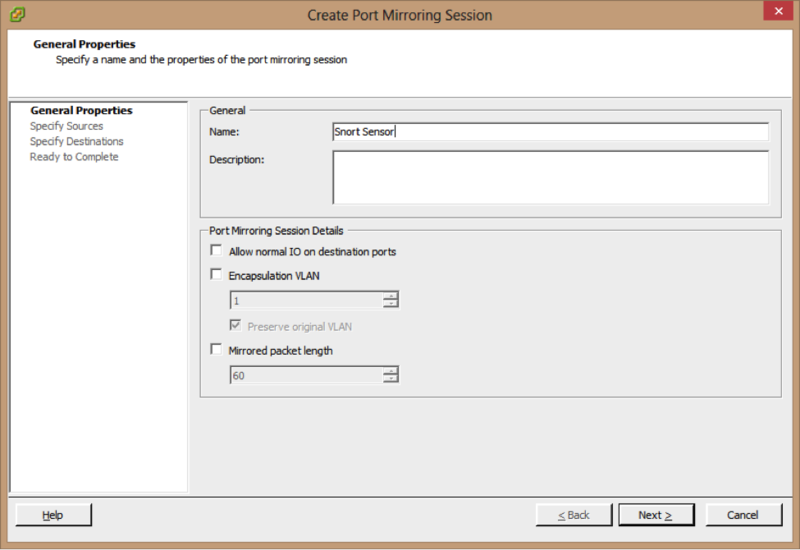 The vDS port mirroring approach is good for capturing traffic from a select few virtual machines for debugging purposes. Therefore, the 3rd party commercial solutions that facilitate tapping the inter-VM traffic are worth considering. If you are missing the dvSwich feature (the free version of ESXi), this can be quite complex. This topic came up yesterday in #vmware, and a given solution is to provide routing back to "a gateway VM" where your probes, etc, sit. This isn't great and it might be better to actually drop some cash on a cheap physical switch or even a physical hub to replicate traffic to your probe (which lives on it's own vSwitch, which is bound to it's own port). Hi, thanks for this wonderful notes. I'm stuck in setting up source port IDs and destination port IDs. 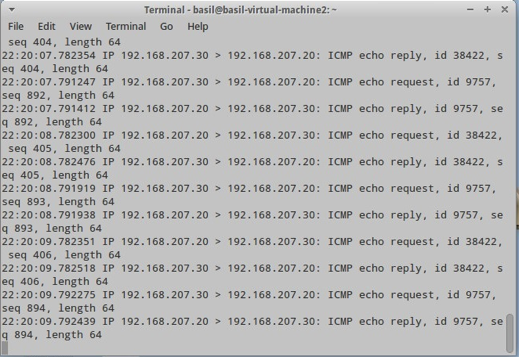 source port IDs - these are the port ID listed against VM host servers and can be found from vDistibuted Switch --> 'Ports' tab? destination port IDs - Is it the port ID assigned against Security Onion vm as Connectee?